If the pithy saying “a picture is worth a thousand words” is true, then how much is a video clip worth? Most broadcast video clips have 30 frames a second. That is 30 pictures a second. That one second of video is worth 30,000 words. Multiply that by a minute. A minute of video is worth 180,000 words. And this is if we are just talking about silent video! We haven’t even added music, audio, or natural sound. How much is a video clip worth? It is one of the richest mediums humans have to tell stories: pictures, words, music, audio all come together in one place. If a picture is worth a thousand words, then an hour of video is worth the entire Encyclopedia Britannica. 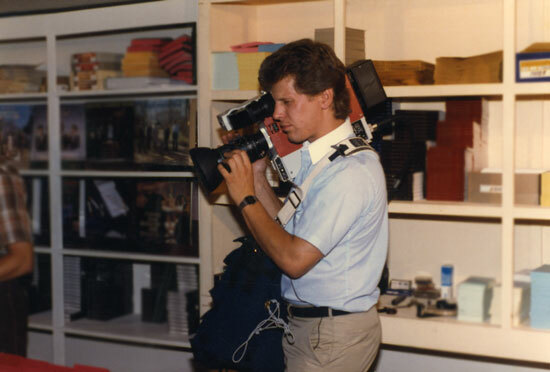 Elam with a broadcast video camera in 1984, his start in the industry. This year has been thirty years since I picked up a video camera. During that time I have shot both professional broadcast video and film. Having a career in broadcast has been a thrill, a great opportunity to meet wonderful people, a ticket to travel the country , and the chance to document a collection of fascinating stories. Each story has an emotional connection revealing heartaches, celebrated victories, exciting thrills, human interest, animal behaviors and much more. Putting a camera on my shoulder (especially a heavy broadcast camera) was a free ticket to concerts and sports event with a front row seat—and sometimes a back stage pass (literally). 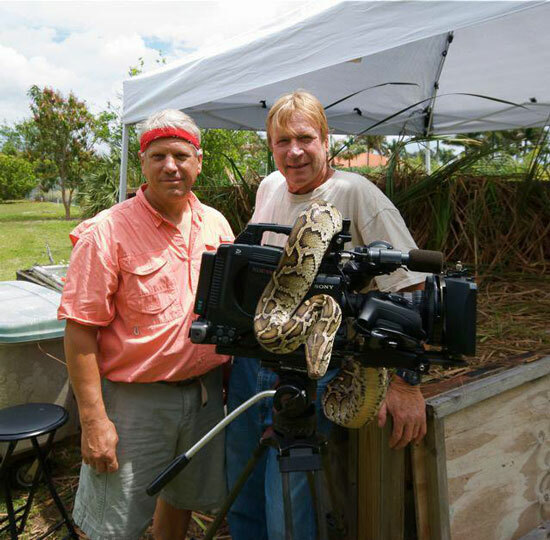 Elam with Joe Wasilewski and an invasive python in South Florida. 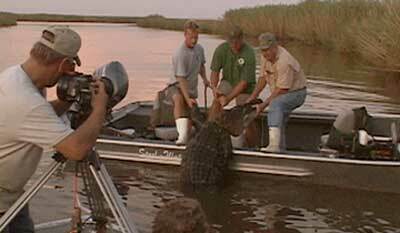 Elam filming a gator being pulled out of the Apalachicola River. 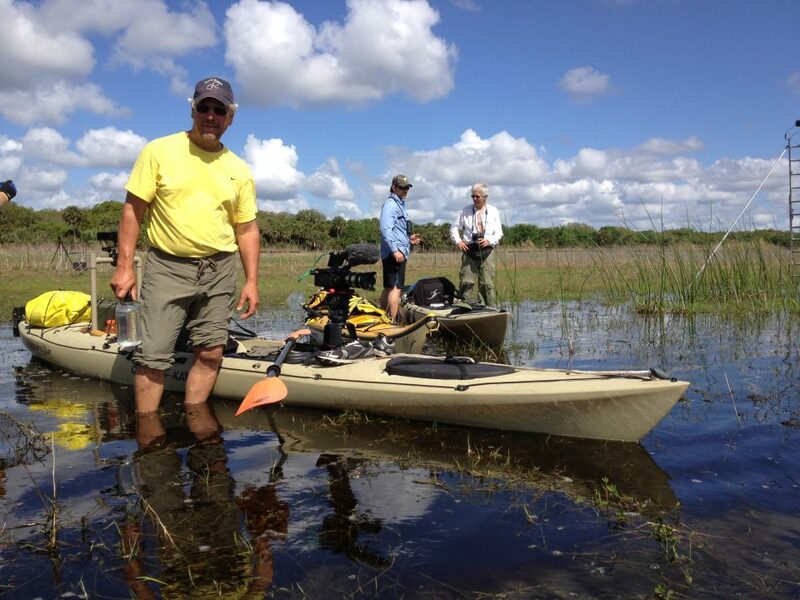 Elam Stoltzfus filming Joe Browder and Clyde Butcher in the Big Cypress National Preserve. When I picked the first video camera up in 1984, it was a game-changer for me. Before I had documented the world around me with a still camera. Video is no longer just images—it is synthesizing many things into one. With video you put together music, sound, photography, and stories into one unified piece. I soon realized that it is a medium that influences millions and millions of people. Film media has a long history, it is very influential. Film production is a challenging art form because of the multiple disciplines used to create a story. With film-making you have to know a little bit of something about many things. In my role as an independent producer and film-maker I have to be a jack-of-all-trades. From the visual side I have to know the composition. Not just static compositions, but moving images. When does an image start, when does the image end? 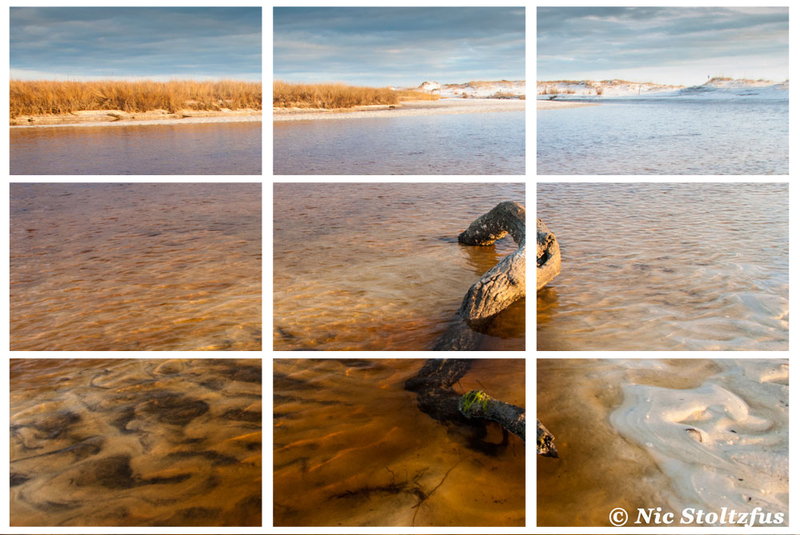 And then not just one image, but multiple images because you have to edit it together the collection of compositions. How are you going to tell your story to your audience? One of the theories of good composition is clues you give to your audience and if you adhere to this structure, this is one of the first things you want to share with your audience. An example would be to feature a homestead in the film. First, give the audience the setting of the place. Where are we? What does the house look like? Is it in the country? Is it in the city? Decide what composition best tells that story: Is it a wide shot? Giving your audience a wide shot first establishes the setting, but you really can’t engage in the conversation if the scene has people. You would want to do a medium shot, get the audience closer and then do some close-ups. Perhaps you have an argument. You would want to do some quick-cuts, you want to do some close-ups. It is taking the audience, engaging them in the conversation, pushing the viewer forward and keep pushing them and, in a way, you are pushing someone into somebody else’s face and forcing them to experience this emotion. Compositions that captures emotions. Then you have music. Music is what allows your emotions to ebb and flow. The ups and the downs. The sweetness, the sour. The love scenes, the anger. Music is that bed that flows and ties it all together. You have natural ambient sounds, you have voices. What kind of voices are you using? Low bass voices, the sound of God, versus sweet-sounding female voices that are enticing and nurturing. Then you have a script—that is the words. Who is writing this? How are these words woven together to tie in with the emotions and what do you want people to know? What don’t you want them to know? What age group is your audience? What is your target? Who are you trying to reach? You have many, many elements, structures and mediums all coming together. Then on top of all that you put this piece together and then you have an opportunity to broadcast the story to the world. Think about this…. here is the story you worked on and it is being shared with millions and millions of people! Sometimes they are all watching this piece of art all at the same time. Now is that amazing or what? Here we are in 2014 with so many new opportunities with the media. We have social media, cable, distribution in ways that we never imagined 10 and 20 years ago. Many new stories and more opportunities are available to educate our world.The world is more intense, and it is going faster and faster and it is becoming smaller and smaller. And we need more material, we need more visual content and we have it everywhere! But where do all these ideas start? The idea starts in your brain. It’s those lightbulb moments; emotionally-charged memories that inspire us to create. We have so many media tools and methods and opportunities to birth these ideas. That’s why the art of film-making is so important. So, if you want to make a movie—go and make a movie! Capture your ideas, share your story with the world. The world will be a better place with your story. Tell a story using video worth millions and billions of words. The world will be richer for it. 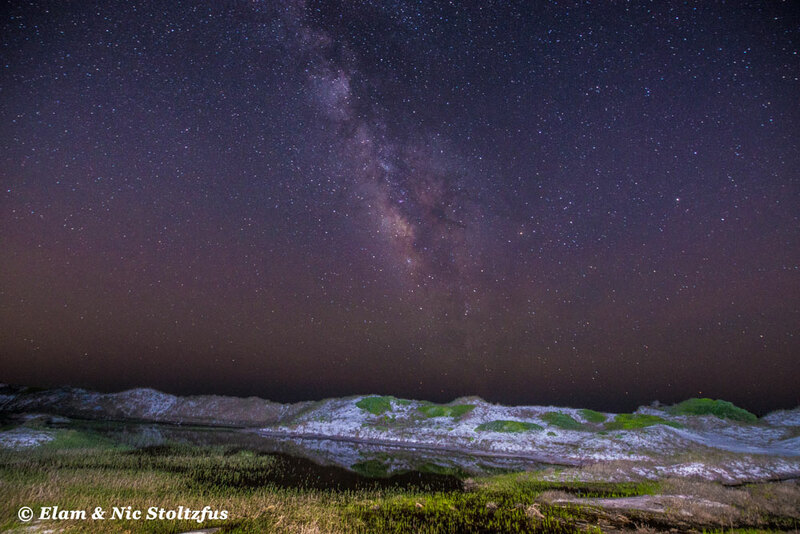 The Milky Way with a series of dunes in the foreground. Photograph taken at Topsail Hill Preserve State Park. Intro: Last week Dad and I came down to Topsail Hill Preserve State Park to do more work for the upcoming Coastal Dune Lakes project. We accomplished a lot over the four days that we were down: interviewed George Langstaff, long-time resident of Four Mile Village,for a story about the creation of Topsail Hill Preserve State Park; filmed freshly blooming lupine (side note: the deep lavender blue of the lupine is how “Blue Mountain Beach” got its name; sailors would see the flowers along the dunes in this area and it looked like a blue mountain to them); set-up a jib shot of carnivorous pitcher plants in a bog close to Morrison Lake; and went out to Western Lake outfall to get some shots of small plovers scurrying along the beach. I really enjoyed all these things, but my favorite part about this trip was the chance to do aerial and night-time photography. After we got done from doing an aerial fly-over we ate at the Donut Hole for a late lunch, took a catnap at the cabin, and then hurried back outdoors in the afternoon to shoot Dad’s introductions for the shorts we are working on. We met up with Jeff Talbert, the park ranger, and we told him that we plan on photographing the night sky starting at 2 AM tomorrow morning. We invited him to come and he agreed to pick us up at our cabin at 2. After coming back Dad and I chatted a bit over a salad dinner, and went to bed early. It took me a bit to fall asleep, but I dozed off finally around 10. I woke up to my alarm at 1:50 and hurried up and got dressed. I saw lights flash and heard a guttural cycling growl outside and knew that Jeff was outside in the “gator” (a beefed-up golf cart, aka utility vehicle). He picked us up and we headed down to the no-name-lake outfall (side note: this is the first time it has broken through in recent history; this is due to the recent torrential downpour of rain). Dad set up the Nikon D800 on the tripod with the dunes in the foreground and the Milky Way arcing between two of the dunes. It was a nice shot. But…we had a bit of technical trouble at first. It wouldn’t snap the picture! Oh, right, we needed to click the automatic zoom on the camera lens from automatic to manual. Right (We didn’t think of that right away—it was 2 am, after all, and we normally aren’t night owls). We clicked the lens off of automatic focus to manual focus. Okay, let’s try again. CLICK. Pause. It was…blurry. Oh, that’s right. When we switched the camera to manual focus, it didn’t have the foreground in focus anymore. GAH! How do we fix that?! By now our feathers were ruffled and eyes wide with stress. 2 am is not a good time to troubleshoot. Luckily, Dad brought an LED light with him that he uses for interviews. It has a dial on it and you can change the strength from dim to oh-my-god-don’t-shine-that-in-my-face-bright. I twisted the dial to OMG-Bright and shone it on the dunes and it was bright enough for him to see the dunes in the viewfinder and turn the lens’ focus dial so the dunes were in focus. Okay. Third try. Third try’s the charm. The camera took the picture and we looked through the camera monitor and….Got it! We hooted for joy and clacked our beaks with excitement. It worked! Great shot. That’s the keeper! 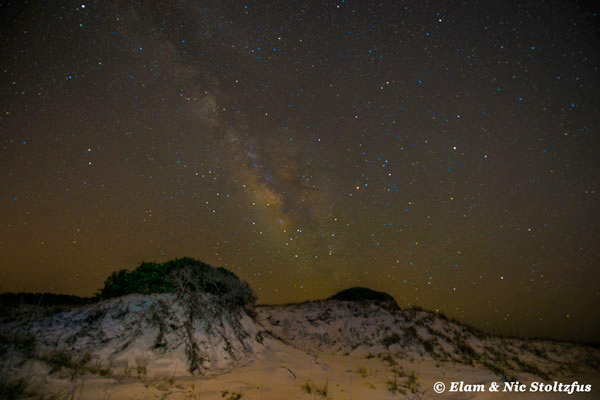 Two dunes in the foreground and the Milky Way in the background. Photo taken at Topsail Hill Preserve State Park. We hiked back a little further and set up to take shots behind a standing pool of water to catch the reflection of the dunes in the water. We took a few shots there and then hiked back to the gator. As Jeff drove us back the sliver of a first quarter moon was tipping westward towards the end of her journey across the heavens. I blinked twice and yawned, I am no night-owl. We arrived back at our roost at 5 am and the sky was just beginning to brighten from twilight blue to the Berlin blue of Hokusai’s ocean in “The Great Wave off Kanagawa.” The sky was the ocean and stars speckles of sand. My body was tired, but my mind was still energetic. I thought of all I did the previous 24 hours—aerial photography, night-time photography—WHEESH! I finally calmed down and soon fell asleep. Goodnight Stars, Goodnight Dunes, Goodnight Moon. 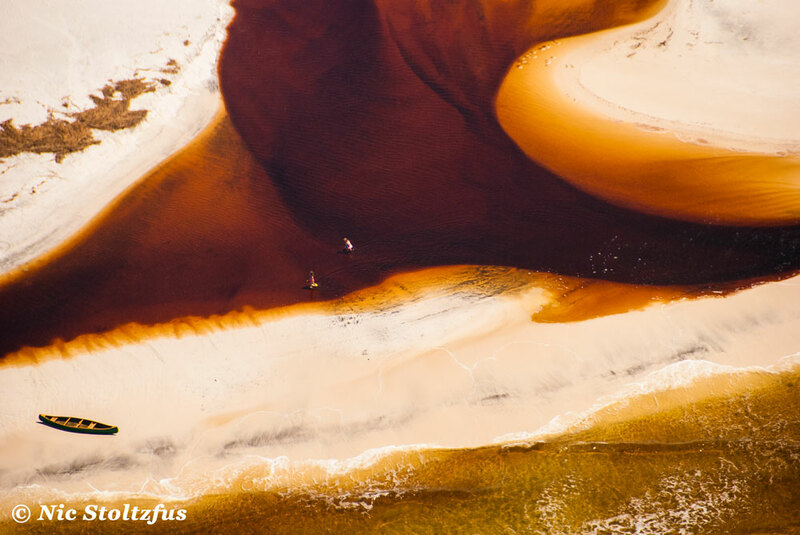 The outfall of Lake Powell, the easternmost coastal dune lake. Intro: Last week Dad and I came down to Topsail Hill Preserve State Park to do more work for the upcoming Coastal Dune Lakes project. We accomplished a lot over the four days that we were down: interviewed George Langstaff, long-time resident of Four Mile Village,for a story about the creation of Topsail Hill Preserve State Park; filmed freshly blooming lupine (side note: the deep lavender blue of the lupine is how “Blue Mountain Beach” got its name; sailors would see the flowers along the dunes in this area and it looked like a blue mountain to them); set-up a jib shot of carnivorous pitcher plants in a bog close to Morrison Lake; went out to Western Lake outfall to get some shots of small plovers scurrying along the beach. I really enjoyed all these things, but my favorite part about this trip was the chance to do aerial and night-time photography. On Tuesday Dad and I woke up and were having breakfast outside in the screened-in porch of our cabin and it was absolutely gorgeous outside. Crisp blue sky, not a cloud in sight. I looked over at Dad and his lips were scrunched up and his eyes were sparkling. What was he thinking? He grinned and looked over at me. “Hey Nic, you wanna fly today?” I knew what he was talking about. At some point in time we planned on renting a helicopter to do aerial photography. He wanted to do it sometime in the next few weeks before the summer haze set in and decreased the sharpness of the photos, and before the vivid viridescence of spring faded into the duller olive greens of summer. Dad called Beach Helicopter out of Destin, but they told him they don’t start flying until 10 o’clock. It was 9:30, so we decided to start driving over that way. On our way the manager for Beach Helicopter (hereafter BH), Kim, gave me a call and said that the pilot Mike was on his way to the landing pad and would arrive in 15 to 20 minutes. I told her we were on our way, as well. She remarked that it was a lovely day to fly, and I smiled and agreed with her. We arrived at BH, right in downtown Destin, and walked into the small shack that is combination hanger/waiting room/check-in/observation shack/cat house. Yep, cat house. 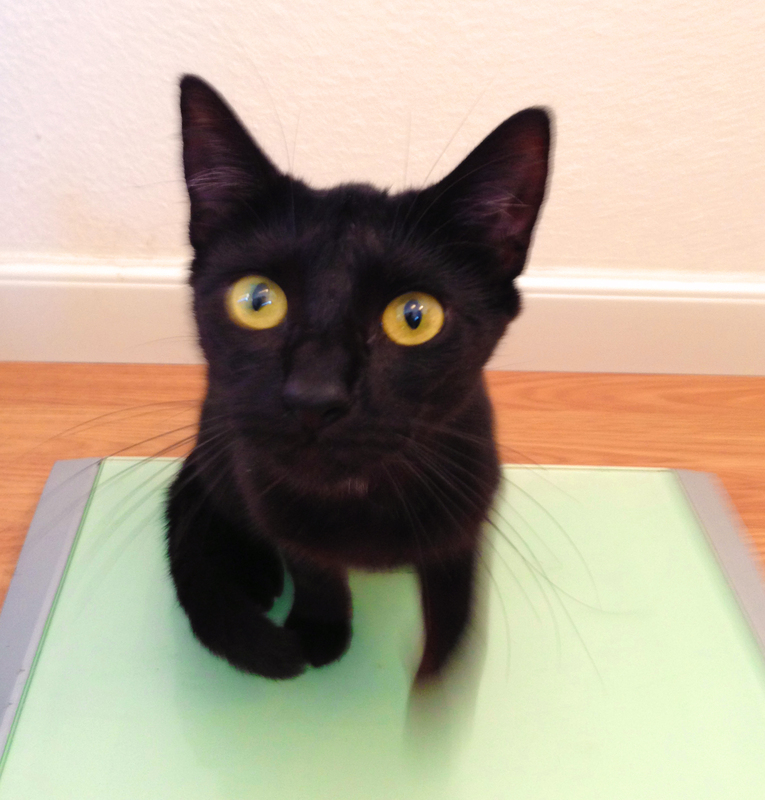 BH has an honorary rotar-kitty, Boo, who was given to them by a local fireman on Halloween. She is a small cat with bright yellow eyes and emanated the most interesting purr: part meow, part growl, part purr, and wholly bliss. Boo, the honorary copter-kitty at Beach Helicopter. Here comes the part of the story that I must admit something: I am not exactly fond of heights. And I passionately dislike rollercoasters. I have a certain embarrassing story my sister enjoys telling with relish of a time when we went to Wild Adventures in Valdosta and rode the “kiddie roller coaster” (against my will) and I screamed like a little girl the whole ride. Upon exit, the jeers and sneers of a gaggle of queued rednecks caused me much humiliation (and caused my sis much laughter). Even landing and flying on an aircraft is sometimes a bit much and although I have never gotten sick and thrown up on an airplane, I have grabbed for the barf bag on a number of occasions. So, I wondered to myself, how would this go? A small airborne vehicle with nary a thing between me and the sky? Wide Open Spaces may be fine for some, but this was not something I desired while 300 feet off the ground. Boo gave us a final goodbye meow and Dad and I walked out to the landing pad. Dad got in the front seat with Mike, and I was in the back duel-wielding two cameras: a Nikon D70 with an 18-200 lens and a D800 with a 14-18 wide-angle lens. Dad had been very specific about the care of the cameras: Always make sure that you have the strap wrapped around you so nothing flies out. Make sure everything is ALWAYS tied down. Mike instructed us to put on our headsets and laid down some ground rules: When the ‘copter picks up speed, don’t hang out of it or the wind will jerk you back. We don’t want that. Echoing Dad’s instructions he said make sure everything is always strapped down because we don’t want anything getting sucked up in the rotor. That wouldn’t make for a fun day. He did a final check with the local air traffic control and started to lift off. My heart starting beating wildly and my stomach began fluttering, likewise ready to take flight, but I kept it under control. It was still a bit much having an open door off to my right and I was terrified of anything flying out and messing up the whole flight. Elam and Mike talking right before lift-off. We made the run around the lakes and Mike chatted with us comfortably the whole time. He is a local and his parents live around the area. He used to run before his knees blew out. “Look down, we’re gonna buzz over my buddy’s house; I do that every time for him!” Stuff like that. That helped me to relax a bit. As I got used to the dynamics of it all, I began to feel more comfortable and gained a sense of equilibrium; Now I wasn’t constantly teetering towards sheer terror but only mild shock. The longer we flied the more I adjusted to it and, by the time we landed, I wish I could have stayed in the air for another hour or so. 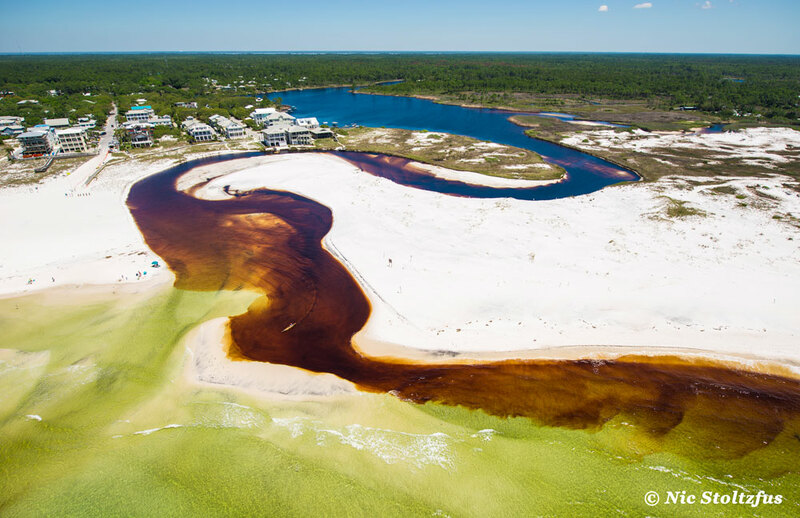 The outfall of Western Lake, the coastal dune lake found within Grayton Beach State Park. A zoomed-in picture of an outfall. As I stepped out of the helicopter after my landing, I arched my back and I felt a dull throbbing pain. My back was tender from moving around from side to side and leaning out taking pictures. There might have been some pain involved in the experience–from the terror of heights to back pain–but the thrill of the experience overrode that, and I can now say that I am an aerial photographer! 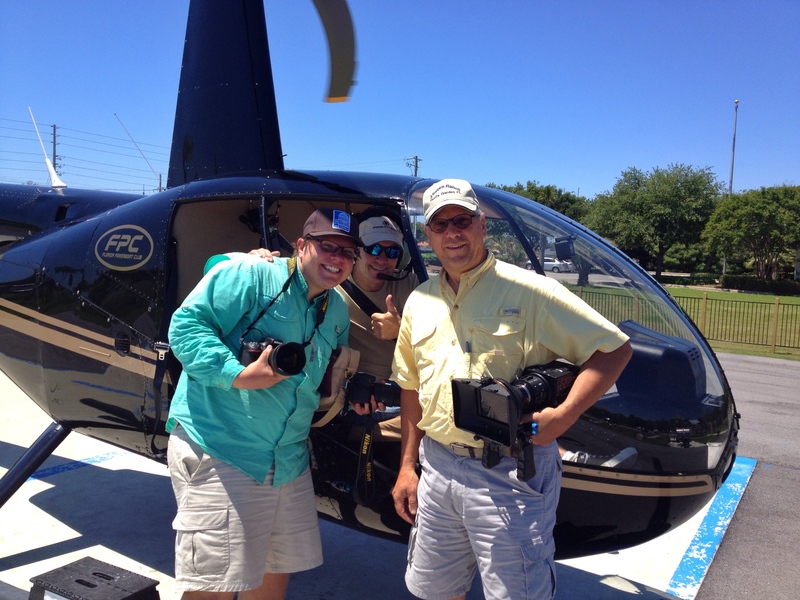 Nic, Mike, and Elam after a successful helicopter fly-over! 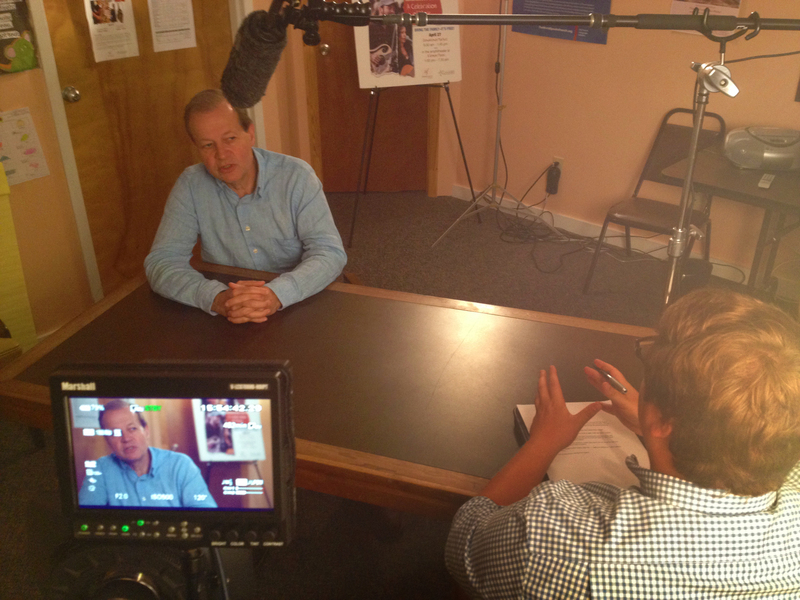 Two weeks ago Elam and I filmed two more interviews for the upcoming Coastal Dune Lakes film. First we interviewed Manley Fuller. He is the President of the Florida Wildlife Federation. They are a non-profit organization that focuses on “preserving, managing, and improving Florida’s fish, wildlife, soil, water, and plant life.” We interviewed Manley because, early in his career with FWF, he worked with local organizations to protect the land that is now Topsail Hill Preserve State Park. The FWF office is located right off of Apalachee Parkway in Tallahassee and, as we went into the building, a collection of FWF staff were just finishing up a meeting. Manley told us to head on upstairs to the office and wait for him. We went up to say hello to Diane Hines, the Vice President of Administration. As soon as she saw Dad she said, “Elam, Congratulations!” He tilted his head sideways and said, “Um…what for?” She told him that he had been awarded Florida Wildlife Federation’s Conservationist of the Year; she had just sent him the acceptance letter two days ago and figured he had already gotten it. “Wow Dad! Congrats!” I chimed in. He grinned and said thanks. Diane’s daughter taught English in Korea during the same time I was teaching English in Japan and we talked about that for awhile and then Manley came back up and told us he was ready for the interview. We set up our interview equipment in the FWF conference room which also doubles as the Alliance Française de Tallahassee meeting room. During his interview Manley highlighted several things about his time working in the South Walton region and also gave us some great quotes. The next day we headed over to Panama City, close to FSU’s Panama City Campus, and interviewed Jim Barkuloo. 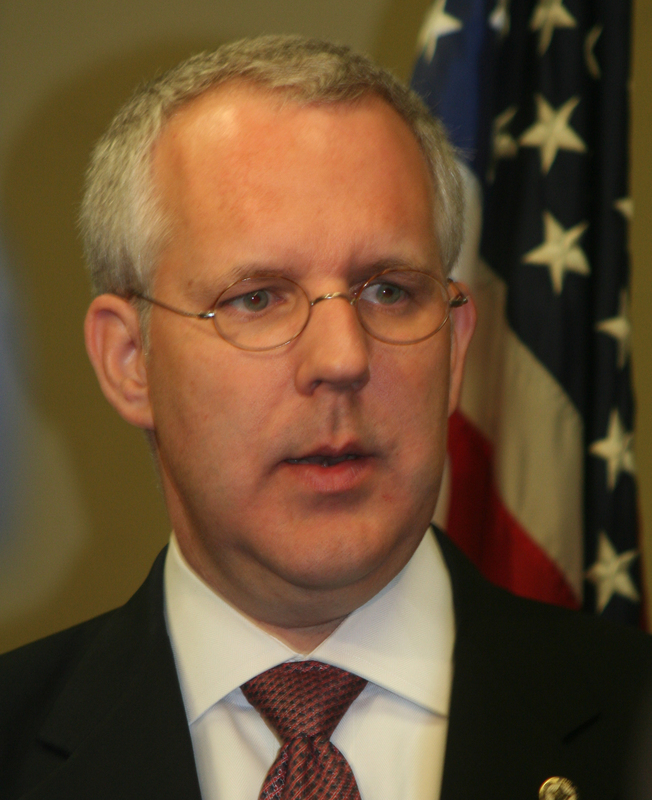 He is a former field supervisor with the U.S. Fish and Wildlife Service. He now works with the St. Andrew Bay Resource Management Association (RMA) as a volunteer coordinator of the Baywatch program and does water quality monitoring in the St. Andrew Bay watershed. He has been doing monitoring with the organization for over 20 years. Lake Powell, the easternmost coastal dune lake, is considered part of the St. Andrew Bay watershed and he assists in doing water quality monitoring there, as well. It was a rainy day and when Dad and I entered his house we took off our shoes so we didn’t get his white carpet messy. As I scanned the room it reminded me of my grandparents’ home—very neat, clean, with a minimalist approach. He had a whole series of encyclopedias on a wall-size bookshelf. When I get old I doubt if I would have hardback encyclopedias in my home. Wikipedia has spoiled it for me, I guess. He asked if we wanted anything to drink, and I requested coffee with a little bit of cream. We sat down and chatted for awhile, in no hurry, before doing the interview. He provided us with some good information about the interaction of the uplands with the dune lakes and also a few thoughts on the dune lakes themselves. It was nice to get two more interviews “in the can” (a film slang for completing shooting on a piece. In the old days, when people shot movies on film, after a reel of film was exposed/shot they would put the reel back in the can: it was finished and the director had the shots he wanted—hence “in the can”). This brought our total number of interviews for the Coastal Dune Lakes film up to 13. We still have a few more interviews to finish, but we have already completed the bulk of them for the film. The summer, we will do historical and scientific research concerning the coastal dune lakes, make a trip to Australia to do a comparison study with the dune lakes there, and start editing down a rough draft of the script. A piece of driftwood at the Western Lake outfall. One morning out on Western Lake (one of the coastal dune lakes in Walton County) the falling light of a sunset rippling off this piece of driftwood was too beautiful to pass up not taking a picture of it. I lined up the piece of driftwood using the Rule of Thirds and had the camera aperture set at 8.0 to allow sharpness throughout in this landscape shot. Photography and cinematography have a lot in common. They bridge the gap between science and art. What I mean by this is that there is a lot of technical things goes into making a camera work. An eye is one of the most complex features of the human body. A camera is similar to the eye, except it is mechanical instead of being organic. Here is the same image illustrating the Rule of Thirds. As you see the driftwood is off-center and lines up with the second vertical line from the left. It also is beneath the top horizontal third. The sky is not lined up using the Rule of Thirds, but it is okay because the visual interest is the driftwood. Photographers use math and mathematical principles to capture an image to present to the public as art. The photographer and the cinematographer bridge the gap between the art world and the mathematical/technical world. A brief example of this idea is how photographers use the Rule of Thirds. The camera screen is split into equally into three parts both horizontally and vertically, so you have a grid of nine identical rectangles. A well-framed sunset would have the foreground in the bottom three rectangles and the sky in the top six rectangles (Or vice versa depending if you want to focus on the foreground). This principle is founded on the precepts of geometry. There you have it—a mathematical formula underlying a photograph. Viewers of the photograph don’t have to understand the principle to say, “Oh wow. That is a good picture!” The above photograph utilizes this principle. To make a good photographer it isn’t a bad idea to have basic understanding of maths. Nowadays digital cameras do a lot of the heavy lifting for you and can automatically do a lot of things that took old-timers a while to set up by hand. But, it is still good, in my opinion, to have a rudimentary understanding of how cameras work in order to gain fuller mastery over them. I have two books that I recently purchased that have really helped me a lot on my journey to taking better pictures. 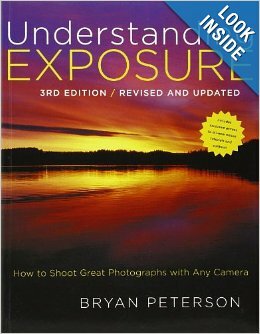 The first is “Understanding Exposure” by Bryan Peterson. This was the first book I purchased and really provided a good grounding as to how the camera captures light. The camera captures things that aren’t always visible to the naked eye, and it is important to know how to set up the camera to capture these details (For example, a long exposure of the night sky can allow the camera to capture light from stars that are barely visible to the naked eye). Also, you can imply movement through certain exposures. This book does a good job explaining this. 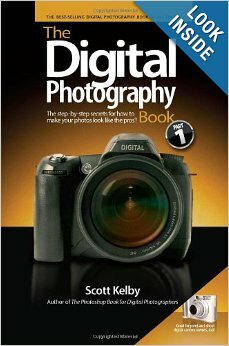 The second book I purchased, about a month later was “The Digital Photography Book” by Scott Kelby and this gets more into digital photography and also recommends equipment that can help you out down the road. 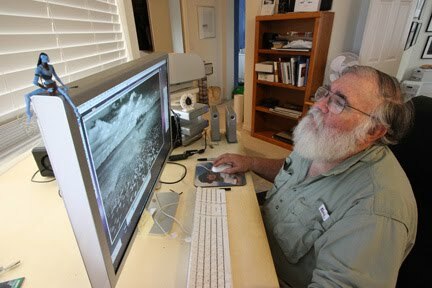 Clyde editing a black and white image using Photoshop. Image by Niki Butcher. Along with these two books I also watched Clyde Butcher’s “PhotoShop Made Simple” which gives a really good grounding as to how to use Photoshop as a digital darkroom (e-mail info@liveoakproductiongroup.com for info on how to obtain a copy). There are some ridiculously simple tricks in the videos that most people don’t use because Clyde approaches PhotoShop as an analog photographer (pre-digital, using large film plates) and goes from that point and creates a bridge to the digital world. It is a different approach to using Photoshop, and I have gotten some really great ideas from there. Along with these three tools the thing that has helped the most is just getting out there. The old saying “practice makes perfect” is absolutely true with photography. But—you must also start the journey by learning what the tools are and how they work. So, read up about your camera and also start talking to other photo-junkies. Look at professional photographer’s pictures on Facebook, Flickr, and other places. Since I am photographing Florida I am most interested in photographers here. Those who I look up and admire include: Mac Stone, David Moynahan, and Clyde Butcher. The wonderful thing about photography is that, like paintings, it allows each individual artist to provide a unique interpretation of the same thing. Monet, Renoir, and Cézanne may all have stared at the same French landscape but each artist interpreted it differently. Don’t be intimidated by other artists. Each of us sees the world differently and no one sees the world the same as you. So, get out there and get creative! Elam with the kayak getting ready to launch on the St. Johns River. For me, a filmmaker, the Florida Wildlife Corridor Expedition was a once in a-life-time opportunity to showcase the landscapes, wildlife habitats, winding waterways and conservation legacies of Florida. “The Wilds of Florida” was like an epic dream come true. I guess it is as Dr. E.O. Wilson says, “[our] love for nature [is an] innate and genetically determined affinity of human beings with the natural world”, that piques my continual interest in exploring and experiencing an in-depth connection with nature. 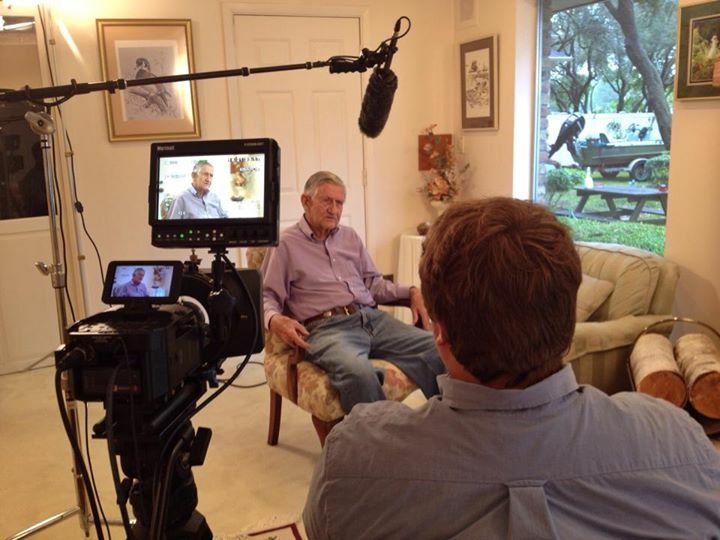 Media introduced me to fascinating stories and characters across Florida. What I found in my journeys was a collection of true life stories, a trove of tall tales, dreamers for a better tomorrow, an active sportsman’s paradise and a diverse interaction with the natural world. Some of my favorite moments during the expedition were early in the morning, especially on waterways with the morning fog rolling in. One particular moment I recall was when we were on a tree island in the Everglades, and misty shower greeted the morning, followed by the sun breaking through the rainy clouds with a rainbow appearing over the sawgrass horizon. In a moment’s notice, I quickly set up the camera. The composition was right there, five feet from the tent. Those were great moments of being immersed in a developing scene around you. 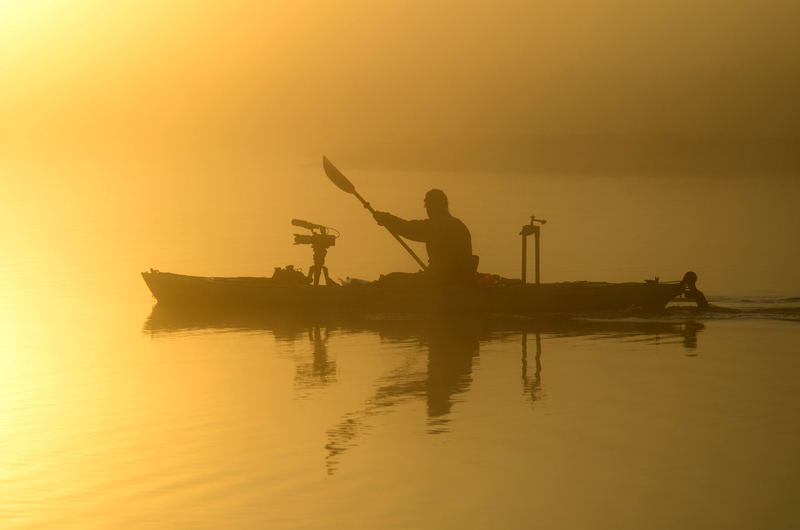 Elam on kayak filming the morning sunrise on the St. Johns River. Image by Carlton Ward, Jr. 2012 copyright. Another scene I recall was a flock of roseate spoonbills along the St. John’s River. It was shallow enough that I could move the kayak with my toes, and I moved slowly through the marsh, keeping the camera mounted on the kayak steady. Finally I was within a few yards of them and got that really cool shot… to be able to capture those images is a gift. And you cherish that time, that interaction between the camera and wildlife. As a filmmaker, having the opportunity to listen to stories shared by the 90 on-camera video interviews with people, meeting with them in their area of comfort, and spending time with them was like having a front row seat in a college class. For many, this was an investment into the greater cause of the corridor concept. A number of them walked with us, some kayaked with the team, others rode horses along side with us and others supported us in their own way. With hours of interaction and recording time, these experts brought so much information to the story that was easily shared to the camera. And if there is a richness to the whole story, it’s what people gave and shared and invested into the expedition. I’m so honored because that’s what makes the richness of the story–it’s those people and their stories. Carlton Ward, Elam Stoltzfus, Alto “Bud” Adams, Mallory Lykes Dimmitt and Joe Guthrie. 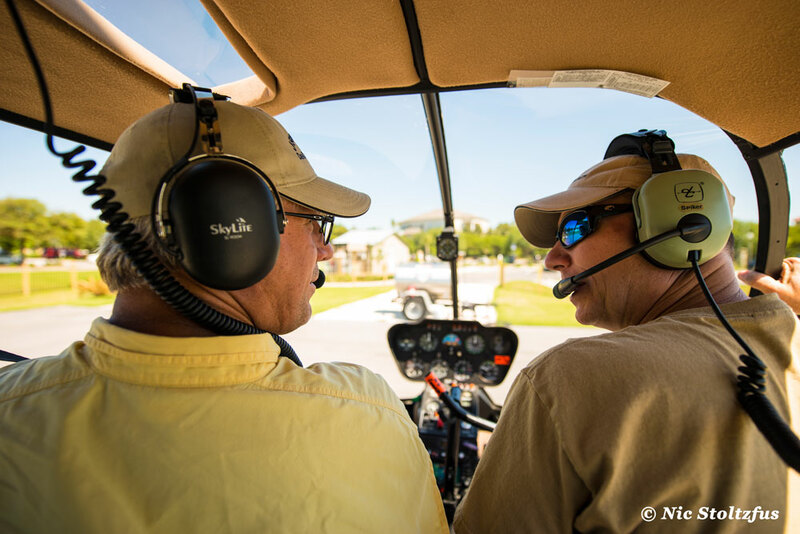 As our team finished the odyssey that was the Florida Wildlife Corridor Expedition, a journalist asked me the question: “Can you give a sentence of your overview of the journey?”. My immediate reply was “into the wind, against the current, and off the beaten trail”. Certainly, our journey was an arduous one, with long days and grueling terrain. We followed spring weather from the southern tip of Florida in the Everglades all the way north to the Okefenokee Swamp in Georgia. 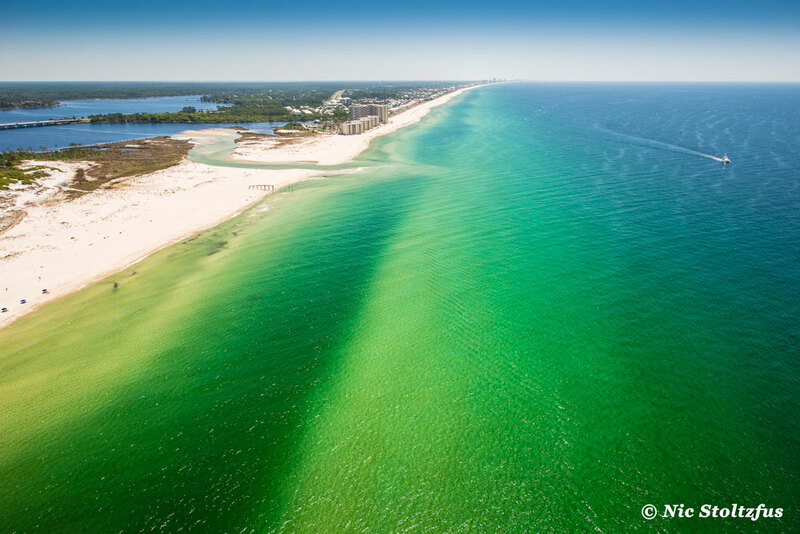 Over 100 days we traversed 1,000 miles of some of the most beautiful locales of Florida’s heartland. But this journey couldn’t have happened with just us. All throughout our journey, from the moment is was merely an idea, there have been people pushing it to reality. From trail angels to pastors, from professors to teachers, from commanders to generals, from bear biologists to park rangers, from corporations to small businesses, from kids to parents, from people of every walk of life, you have supported our journey. 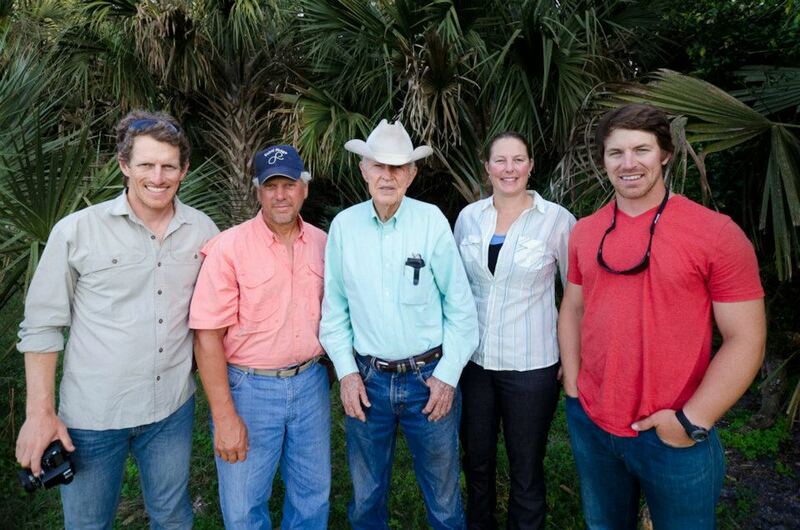 As we traversed Florida’s landscape we collected a lot of pictures, video, and interviews. We discovered what brings us together, what we have in common. We all want to preserve the environment for current and future generations. We want to continue to see habitat restoration, endangered species protection, and cross-agency cooperation become a part of Florida’s landscape. During our expedition we experienced the real Florida. And this is what we have learned: Our journey is really just beginning. 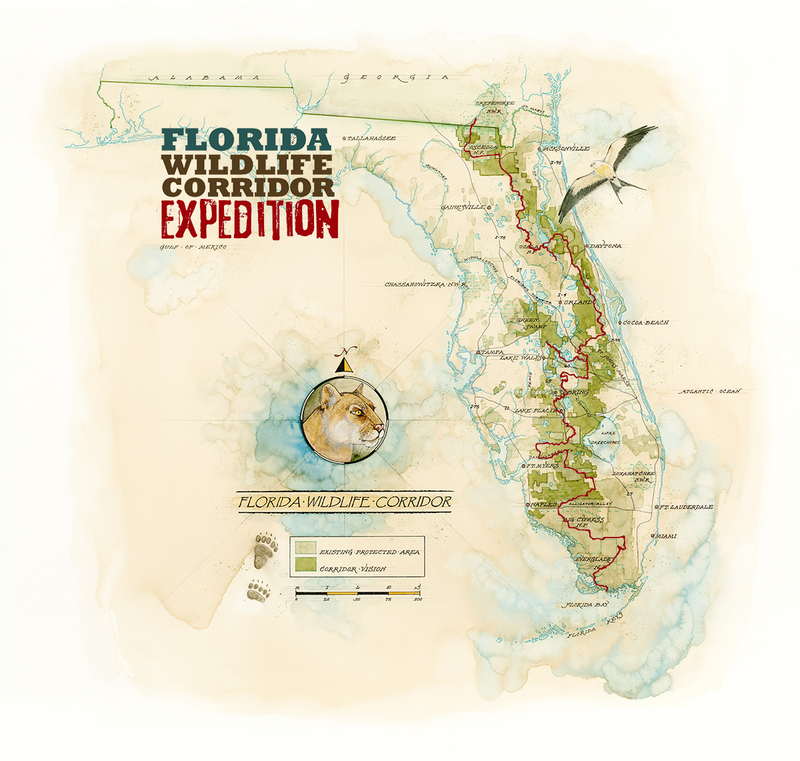 With your continued support we have the opportunity to bring this idea of the Florida Wildlife Corridor into reality. May our decibels increase as we express our concerns in a unified message. Like many journeys this will be one that is into the wind, against the current, and off the beaten trail. As you celebrate Earth Day 2014, take time to reflect on some the greatest gifts we have been given, our wilds of Florida. Engage in the great outdoors, observe wildlife and most of all, renew your spirit with warmth of the sun, feel the wind in your hair and feel the soil in our toes. My parents didn’t necessarily encourage me in the art world, but they didn’t discourage me. 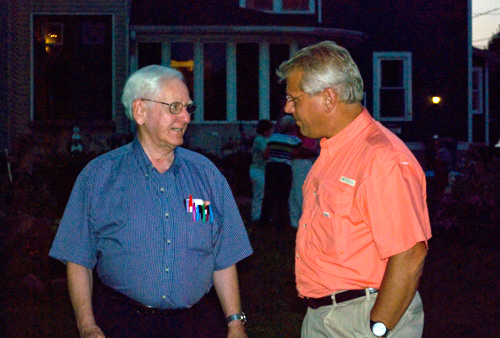 The first step that was really important for me in the arts was my first-grade teacher, Mr. Jere Brady. 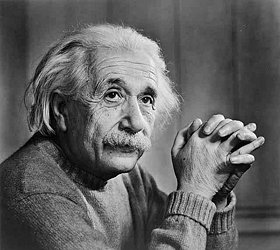 I still vividly remember sitting in a small wooden desk watching him take a blank piece of paper and pencil and sketch the schoolhouse building. I thought, “Man, how cool is that?! He made something out of nothing!” I wanted to be able to do that, one day I wanted to be able to fill space. At that point I said I want to be an artist and that really never left me since first grade. I knew one day I was going to be an artist. During that year Mr. Brady taught us primary colors, how to use crayons, how to paint, and how to do pencil sketching. He was my only art teacher for three years; first, second, and third grade. Mr. Brady was a mentor at a very early age. Just as an aside, I still consider Jere a mentor, Jere and his family live in Morgantown, Pennsylvania where he has a art gallery, involved in the community and I still keep in touch with him—we e-mail back and forth at least three or four times a year, share Christmas cards, and EVERY time I finish a new film he gets one of the first copies. One thing is that practice makes perfect. You have to do it over and over again. It’s like learning to play music, how do you get good at music? You practice and practice. You sing it, you play it over and over and over and over again. Same thing with photography and film-making. How do you take good pictures? You take lots of them and then you do it over and over again. In the book Outliers , author Malcolm Gladwell says that it takes about ten thousand hours of practice to achieve mastery in as an artist. There is not necessarily any right or wrong way of doing things. 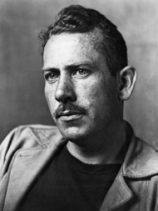 Photography, film-making, music are all interpretations of art. And so that connects into your own emotions. What are you feeling? What are you seeing? What are you trying to put together? What is the story you are trying to tell? These are your experiences and you are trying to put your emotions, your feelings, your insight, your understanding into this film and wrapping it, tying it into a story and putting it out there for the general public to experience. You hope in the end that it is something that this piece of art has been helpful to someone. It really starts from what you feel inside you. My advice is just do it! Like the Nike slogan, “Just do it”. If you have a formal art education or if you are able to work under a mentor all that is great. Some people give you rules and laws and say do it this way, well that is great to work in that function, or in that structure for awhile, but eventually don’t be afraid to explore and break some of the rules. There really are no rules in art. But if some people want to call them rules or this is the only way to do it, then do it for a little bit, but eventually explore. You know, it is like the little kid with the coloring book: they are told to only draw inside the lines…no, no, no, no, no! Don’t be afraid to go outside the lines! 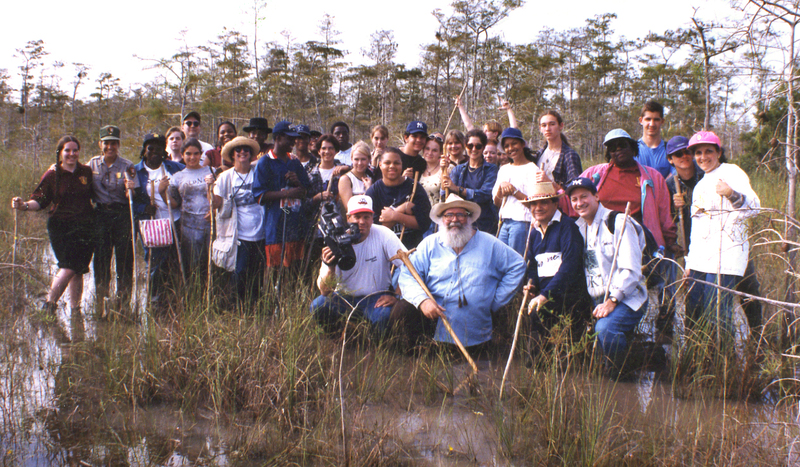 Elam and Clyde Butcher with a group of Broward County students in Big Cypress National Preserve. 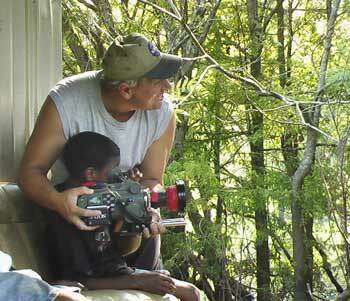 Putting the film camera in the hands of a young boy along the Apalachicola River while stopping at a local house boat. There is always somebody that you can mentor, somebody that you can influence. And art can do that. So, when you have opportunities to point somebody in a direction or hold their hand for awhile, or give them an experience in the arts, or an opportunity in a career, be bold and invest in a student. These all become legacy moments because you take a little bit of your time to make a change in somebody else’s life. Or give them an opportunity that they never thought they would have. That is what happened to me. When there are opportunities to give back, I want to invest in students and will do this. Author with a group of FSU students at Tall Timbers. Image by Nic Stoltzfus. The author teaching a group of students about outdoor filming techniques. Image by Nic Stoltzfus. 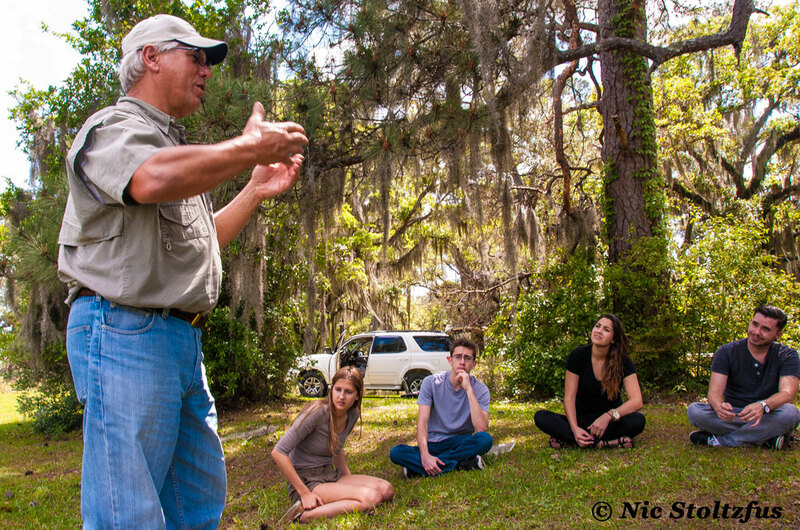 Several weeks ago – April 12, 2014, my son Nic and I held an outdoor video workshop in partnership with the Florida State University College of Communication & Information at Tall Timbers Research Station. We had 8 students from FSU attend along with 3 employees from Tall Timbers. Most of the students had not experienced film-making outdoors. We spend most of the two hours talking about storytelling. What are the pieces of the puzzle to tell an engaging story? It begins with a plan, a concept of the objectives of the story, moves on to filming a series of interviews, collecting natural sound and footage of the environment, scoring music, preliminary editing, post-editing—all these steps until a final polished nature documentary is created. Most folks have not thought about all the elements of images, sounds, text, and information that need to be brought together to make an engaging media documentary story. I’m grateful for the many hours that mentors have invested into my life and allowed me to succeed in my career as a film producer. I hope to share my experiences with others, to share with today’s young minds and enable them to succeed in their future careers.